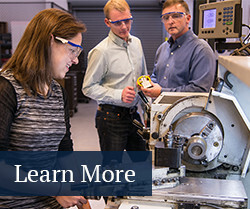 The Mechanical Engineering Technology (MET) degree program offers structured exposure to technical areas such as computer-aided drafting (CAD), computer-aided manufacturing (CAM), robotics, materials, product and process design, and machine design. The program includes two tracks - a two-year associate degree (2MET) and a four-year bachelor's degree. Graduates of the 2MET program become engineering technologists who work as machine, product, and process designers; computer-aided drafting and design (CADD) operators; personal computer integrated manufacturing specialists; planners; technical sales people; production supervisors; laboratory technologists; and managers. Graduates of the 2MET program may also pursue a four-year degree program in mechanical engineering technology (4MET) or electro-mechanical engineering technology (EMET). Graduates of 4MET are prepared to assume responsibility for the development and evaluation of machines and mechanisms; development, organization and supervision of manufacturing processes and procedures; the instrumentation, control and testing of a process; quality control; technical marketing and sales; design of mechanical systems for heating and cooling; and energy management. The strengths of the program include: hands-on training; extensive laboratory experience; state-of-the-art computer methods; and good job placement. The MET program is accredited by the Engineering Technology Accreditation Commission of ABET, www.abet.org. The 2MET degree is offered at the following locations: Penn State DuBois; Penn State Erie, The Behrend College; and Penn State York. The 4MET degree is offered at Penn State Harrisburg, The Capital College. Be able to apply the knowledge, techniques, skills, and modern tools of mechanical engineering technology to narrowly defined mechanical engineering technology activities. Be able to apply a knowledge of mathematics, science, engineering, and technology to mechanical engineering technology problems that require limited application of principles but extensive practical knowledge. Be able to conduct standard tests and measurements, and to conduct, analyze, and interpret experiments. Be able to function effectively as a member of a technical team. Be able to identify, analyze, and solve narrowly defined engineering technology problems. Be able to communicate effectively regarding narrowly defined mechanical engineering technology activities. Be able to recognize the need for and an ability to engage in self-directed continuing professional development. Demonstrate an understanding of and a commitment to address professional and ethical responsibilities including a respect for diversity.